The landscape in western art has always been about more than picturesque scenery: it symbolized God’s handiwork in premodernist art; with the modernists it became a vehicle for expressing how human perception and painterly transcription cooperate, or as a pretext/stimulus for expressionist gesture of vibrant color. In some of the best contemporary art, it has become a symbol of human culture’s mixed legacy: the natural landscape is “spoiled” by development, but that development yields its own strange, hybrid, transient beauty, proliferating and/or collapsing before our eyes. Castellanos’s large-format color prints — which, once mounted to Masonite, he cuts with an X-Acto knife into lacelike dappled-light/shade patterns and then partially repaints in oil or inundates with resin pools — thus become metaphors for resource extraction and commercial development. Castellanos: “I’ve been capturing landscapes that are desolate — meaning without people — but there’s a presence of people through the debris. . .the paint acts as a toxic agent, infiltrating the landscape. . .[and infusing it with] a mysterious energy.” That energy comes through even in this relatively small show of eight pieces. 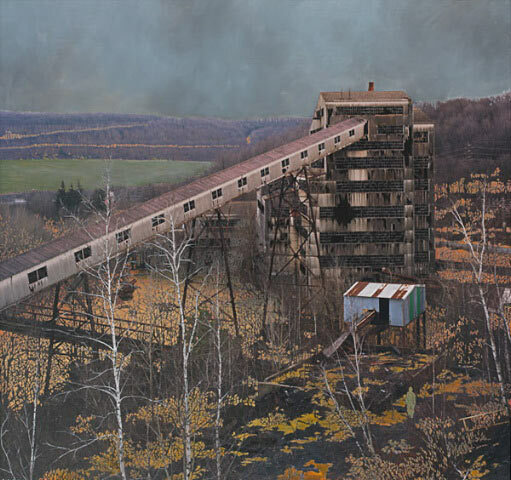 While a few of the works (the monochrome glossy-black 'Smokestack,' the self-conscious 'Self-Portrait Mapping') seem to belong to another body of work, the industrial (or post-industrial) sites depicted in 'Mahanoy City,' 'Water Gap,' 'Swamp Bonham,' and 'South Gate' compellingly, beautifully combine the old romantic sublime of 19th-century painting with the matter-of-fact scrutiny of the 20th-century photographic tradition. We both marvel at their intricate detail and coloristic verve, and then, stepping back, get the big picture.